As the Boomer population ages and retires, massive shifts in the housing market are to be expected. One current popular trend with these older Americans is manufactured housing in land-lease communities, where homes are placed on leased land and the overall price of the home is lower than other types of homes. And many of these communities offer senior-friendly amenities. “While land-lease communities are popular with people of all ages, those over 55 may particularly appreciate the affordability and lifestyle benefits they deliver,” says Richard Jennison, president of the Manufactured Housing Institute. Manufactured homes can cost an average of $68,000, compared with $276,000 for a single-family, site-built home. There’s also more home for the buck: As they often cost up to 20 percent less per square foot than site-built homes, with comparable interior finishes. For those who are retired or approaching retirement, affordability is a significant factor to consider. Additionally, such homes are quite easy to customize over time in order to meet the changing needs and abilities of an individual. Furthermore, many land-lease communities on which manufactured homes are situated are dedicated to those over 55 years old, and some come with amenities like community clubhouses with scheduled activities, exercise facilities, swimming pools and lakes for boating and fishing. Jennison said boomers and retirees who are anticipating less mobility in the years to come are finding communities with “everything at their fingertips” to be a built-in defense against isolation, and a convenient and practical alternative to a conventional neighborhood. Well-groomed grounds, and nice landscaping, common to these communities, can provide convenience to those possibly unable of doing their own yardwork. Information about these types of manufactured homes and communities can be found at facebook.com/Manufactured-Housing-Institute. 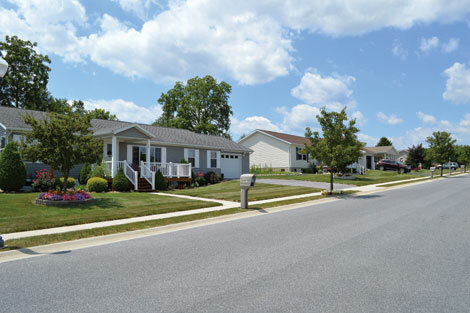 Land-lease communities for manufactured housing can be attractive to folks over 55.